My thanks to Hieronymus for send me the ink samples. This is ink 3 out of 3 reviewed. You can find the review of Hieronymus Brown 03 and Hieronymus Blue 01 here. This is a dusty purple sort of colour. It reminds me of Rohrer and Kligner Scabiosa or J. Herbin Moondust Puprle but once I’ve compared the swabs it is clear Violet 02 is a colour that’s rather unique. Like Blue 01, it’s subtle enough for the workplace but has enough colour to show its personality. It’s a throughly enjoyable ink to use. Violet 02 has slight shading. It goes from faint grey-purple to a dark almost black colour. 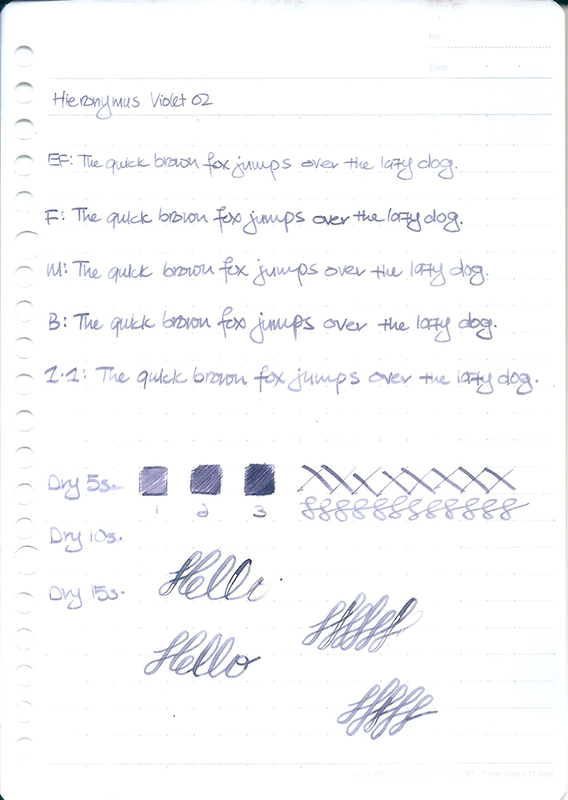 I will be giving away the remaining ink sample of Hieronymus Violet 02. Just drop me a comment below. This giveaway is open to all residing in Singapore. The giveaway ends 2nd May. Once again, my thanks to Hieronymus for providing me a free sample of Blue 01. You can find them at their website or Facebook and Instagram. Photos of ink bottles and ink packaging provided by Hieronymus.